The first all over the world. A better quality, a better service, an innovative revolution in medical field. This is Healthfil Line: the first medical line filaments worldwide, made by TreeD. A new generation of filaments in medical use: especially developed for extrusion technique, these are the first with a skin contact certification. They allow more complex realisations than conventional machines and the result is a brace that adapts itself perfectly to your body line. 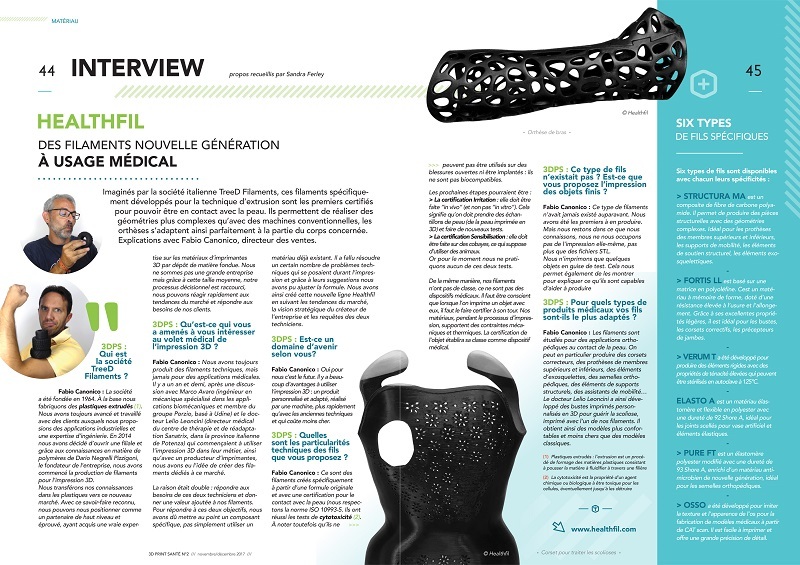 These are the words of an interview made with a french magazine, 3D Print Santé, about our company and innovative products of Healthfil line. – Thanks to a good know-how we can propose ourselves as a high level and trusted partner, having acquired huge and wide knowledge about FDM 3D printers’ materials. – We are not a big reality but this dimension makes us very fast in follow market trends and fit our customer need. Considering also a very fast processing decision time. About a year and a half ago, talking with some technicians (an italian orthopedic and a prosthodontist: Ing. Marco Avaro and Dott. Lelio Leoncini) who were starting to use this technology for their application, and in collaboration with a printer producer too we’ve got the idea to create filaments dedicated to this market. We created that line by following market trends, our owner’s strategy and the two technicians’ requests. Giving a plus (certification) to our products means to make them being certified. Do you think it is an area of future? Yes, for us this is the future. Have you ever got a particular request that made you interested in medical applications? Yes, as I already told you one and half year ago by talking with the italian technicians Ing. Marco Avaro and Dott. Lelio Leoncini and also a printer producer. Then we chose to join this market. What are the technical features of the filaments you offer? What are the particular constraints for such filament to be recognized as biocompatible? Please be informed that we didn’t make any test for Biocompatibility. Our filaments can’t be used on “open wounds” or they can’t be implanted. I can confirm you that they respect ISO 10993-5 regulation and they passed cytotoxicity tests. 1) irritation > this certification should be done “in vivo” (and not “in vitro”). 2) Sensitization > this certification should be done through tests on guinea pigs. At the moment we do not make any tests in those two ways. We would like to inform you that we didn’t have the FDA, yet. As soon as we will have any update we will inform you. I wanna conclude that our filaments do not have a class. They are NOT medical devices. You must pay attention on this. Once you print an object, you should make it certify once again. Our materials during printing sustain some mechanical and thermal stress. Certification of the object will establish – as medical device – the class of it. This type of filaments has never existed before? Do you only offer threads or also the impression of finished objects? No, this kind of filaments has never existed before. We are the first one to produce them. Note that we do not provide a “service” and we do not sell stl file or printed objects. For which type of medical products is Healthfil the most suitable line of filaments? The filaments are studied for orthopedic application and for skin contact. Are you working in relation with doctors, hospitals, researchers? Yes. In order to develop products, as I told you before, we partnered with two technicians and a printer producer. Now we are closing business partnerships with potential customers and distributors all over the world. Exactly, could you explain the process of manufacturing an object from a doctor request to the finished product. Someone (a young guy or girl) with a health problem (for example scoliose) goes to a doctor. The orthopedic decides that a bust (for example) could help or solve his/her problem. He suggests 3D printing technology as the new frontier. Then he proceeds to scan the body (bust) of the guy/girl. * to print this bust there are some specific filaments. Ours. ** once the orthopedic made the printed bust he should (cause it’s his own responsibility) have to make this bust been certified. Do you have other upcoming projects, new types of products or other still in medical field? Yes. As i already told you, we would like to receive new certifications for our products, like irritation and sensitization. It is not easy and we do not make any tests in those two ways at the moment, but these are our objectives for the future and we’re working on it. Why do we report this interview? Because we are proud of our work, our company history, our development, our products and our innovation in this market. If we captured your interest and you would like to know something more about our Healthfil line and our products, do not hesitate to request now your complete sample pack!